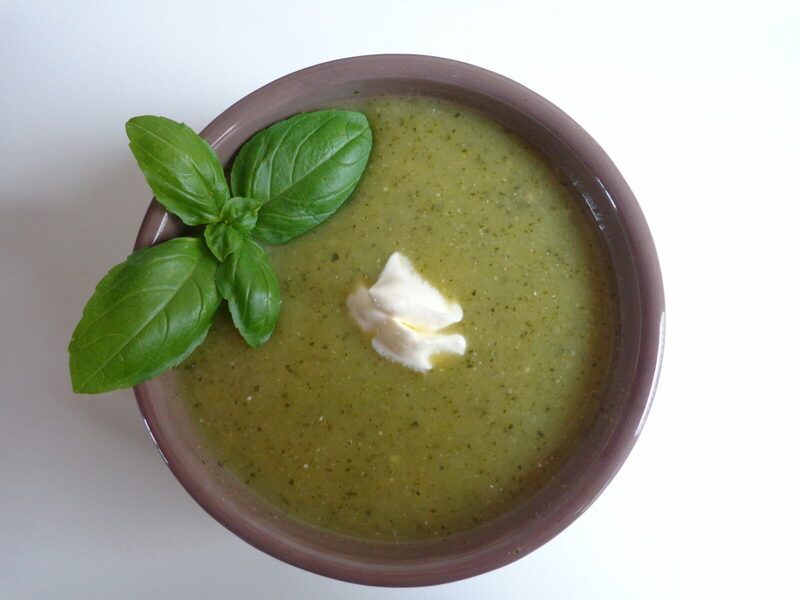 This zingy soup may be prepared ahead of time and reheated just before serving. Or, in the dog days of summer, you may prefer to serve it cold. You can control the zinginess by deciding to use cayenne pepper, or not. As for the broth, it’s not absolutely necessary. If you have some chicken or veggie broth on hand, fine, but if not you can use water, as I often do. The flavors of the zucchini and spices make it a rich-tasting soup — and, by the way, it’s also a healthy one. Pour the broth or water into a soup pot. Rinse the zucchini, remove the ends and cut into chunks. Peel the onion, leaving it whole, and cut a cross in the top to prevent it from coming apart while cooking. Add the zucchini, onion, salt and tarragon to the soup pot. Bring to a boil, turn down the heat a bit and simmer until the zucchini is very tender, about 30 minutes. Remove the onion from the soup pot and discard. Purée the remaining contents of the pot using a hand-held blender, countertop blender or a food mill. Transfer to a clean pot. Add the lemon juice and cumin. Grind in some black pepper. Taste and adjust the spices as necessary (this usually means adding a bit more salt). If using the cayenne pepper, place it on a paper towel, fold the towel over it and crush, being careful not to let the pepper flakes touch your hands. Add the cayenne to the soup. When ready to serve, reheat the soup gently — do not allow it to boil. Add 1 tbsp. crème fraîche or 1 tbsp. heavy cream and stir to blend. Pour the soup into individual bowls and top each bowl with a dollop of crème fraîche or sour cream. Add chopped fresh herbs if using. Serves 3. Meg: Great recipe. I made it this weekend and loved it. Thanks, Cathy! Good to hear. Newly diagnosed diabetic — these are great recipes for moi.